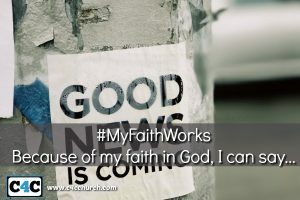 Because Of My Faith in God, I Can Say… | Champions 4 Christ Inc. I am not moved by what I see. I am not moved by what I hear. I am not subject to the times. I will keep obeying God. I will keep sowing seed. I will keep walking by faith. I will keep going to church. I am separated from fear because of my faith. I am walking in my God given purpose.